In honor of our Roots ‘n Boots music issue, ex-App Oscar Parsons shares his story of how he got to be a fiddler in a bluegrass band in a flat, almost mid-western city miles away from his mountain south home. When Oscar Parsons moved to Louisville almost a decade ago, he brought some of Sugar Grove, his small hometown in Smyth County, Va., with him. By trade and training, he’s a leather worker, crafting bags and other items that appear in some of Louisville’s trendiest stores. But most people know him better as the affable front man of Thomas A. Minor and The Picket Line, a band that played bluegrass/new grass/ contemporary old-time, or whatever it is, around town for the last 5 years. “…bastardized folk, I’d call it,” he said late one evening this winter, his hand curled around a beer, the light from a dive bar in Louisville’s historic Germantown neighborhood glowing soft around him. Making things and music are gifts from home and family, a place and people he’s left, but not forgotten. “They all live inside me,” he said. He is of this city now, with its shotgun homes and alleys packed in close around him. He is also of back home, its rolling mountains, orchards and farms. Not that the two landscapes always marry well in his own mind, or in others, for that matter. At the time he left, in his early adulthood, it was a fast break from an uncertain future. He grew up poor but happy. His mom worked for a sewing factory and his dad played guitar. Parsons started playing too when he was about 14, gravitating toward rock. He played with a band that sounded “kind of like the Deftones,” in venues around the region. They joined a music co-op to help with finances and even briefly flirted with a Sony record producer. Then Parsons’ dad died of lung cancer. And, it changed him. Parsons turned to folk, the music of his father, and prescription pain pills to dull the pain of losing him. His drug usage got ugly for awhile. He needed to get away from how he was living. He fell in love with a girl who wanted to come to Louisville. The only thing he really knew of the city was Ear X-tacy, the famed, now defunct record store. They lit out with $100 in their pocket and a plan was to stay just awhile. That was a decade ago. In that time he taught himself everything there is to know about working leather. He uses vegetable-cured leather, the most eco-friendly kind, and gives his pieces a worn, well-loved look. He’s fond too of painting characters on them, like deer and other animals. 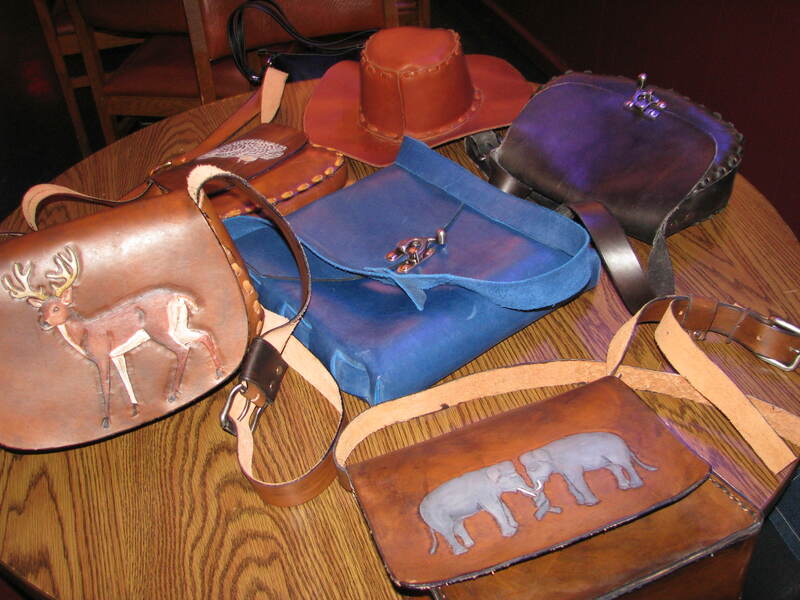 His handbags, wallets and bracelets can be found at stores like Salvo, Dot Fox and Cherrybomb in Louisville. Customers carry his pieces as far away as Italy, Egypt, India and New Zealand. His sister, who lives in Los Angeles, helped him land big name clients such as Colin Farrell and William Mapother. Seeing people enjoy his handiwork is the best compliment, he said. 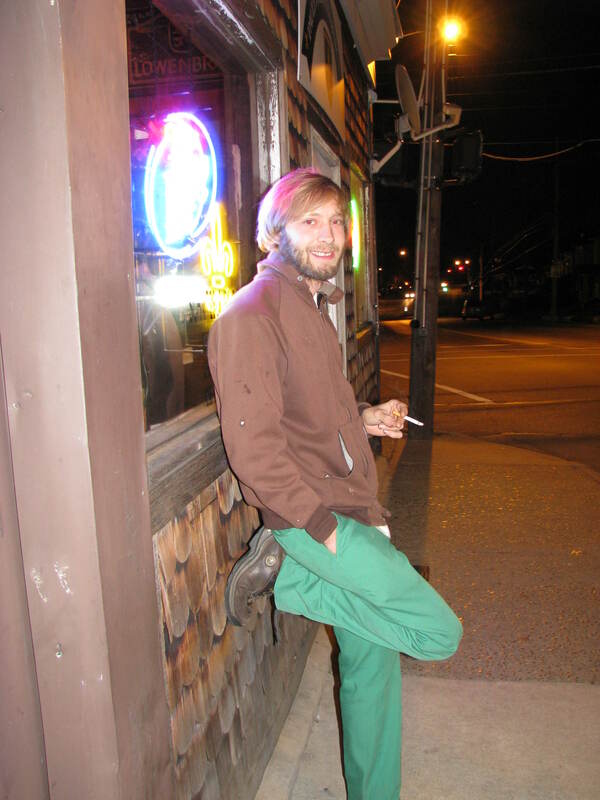 After years playing Louisville’s hipster hangouts, dive bars and festivals, Thomas A. Minor and the Picket Line is currently on hiatus while a band member travels. But we’ve undoubtedly not seen the last of Parsons. He has a feel-good vibe about him that plays well with an audience. He draws them in with his toothy, Alfred E. Neuman grin and goofy jokes. He insists they sing along ’til everyone is and having a good time doing it. His voice has almost a ragged edge, sounding as worn as his leather pieces look, and it sets well against a twangin’ melody. For those of us from the mountains, it sounds like home. Click here to see Thomas A. Minor and The Picket Line perform.